Please refer to our stock # 1293 when inquiring. Kimura Morikazu was born to the house of a Kyo-yaki potter and studied under Ishiguro Munemaru, He established his first kiln in the Gojo Zaka area of Kyoto in 1947, moving to Fukui in 1976. He is held in the collection of both the Kyoto National Museum of Modern Art and the Imperial Household Agency. He has been displayed at innumerable private exhibitions in addition to major exhibitions such as the Nitten, Nihon Dento Kogeiten(National Traditional Crafts Exhibition) and Nihon Togei Ten (National Ceramics Exhibition) among others. 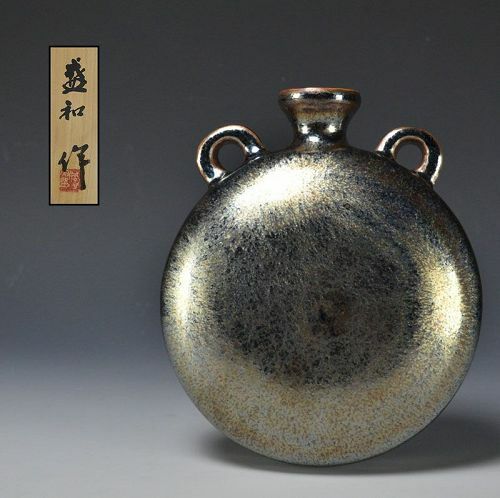 Winner of the Japan Ceramics Society (JCS) award, purchased by the Ministry of Foreign affairs. Morikazu has been incredibly influential on the subsequent generation of potters.